Pendant measures about 1" tall, and hangs with a gold-plated brass hexagon on a 16", 18", or 20" gold-filled cable chain with a lobster clasp. Model is wearing 16" length. 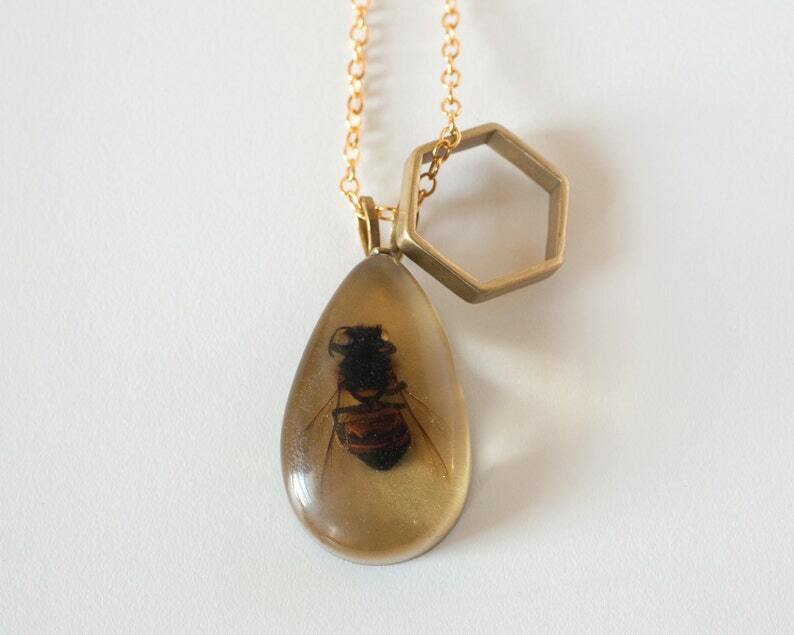 My series of real bee jewelry features Italian honey bees encased in resin. To make these pieces, I collect the dried-out bees then place them in molds and build up layers of resin around them. Near the end, I put in a layer of gold leaf, then a final layer of resin over that. It ends up having this lovely amber glow, especially when the light hits it. Absolutely stunning ! The necklace hangs in just the right place and always a conversation starter!! I bought this for my mom for her birthday. While she was growing up, he grandparents were bee keepers and they would sell their honey on their farm. I thought this would be the best present for her and she loved it! Really great necklace plus some money goes towards saving the bees! !